Note: If you have a Pro Managed WordPress account (available U.S.A. and Canada only), use these instructions instead. Note:If you see You don't have any available sites, click Buy New Plan to purchase an additional plan, or click Cancel to return to your list of WordPress websites. From the list of Your existing plans, select the Managed WordPress plan you want to use for the site you're moving, and then click Next. 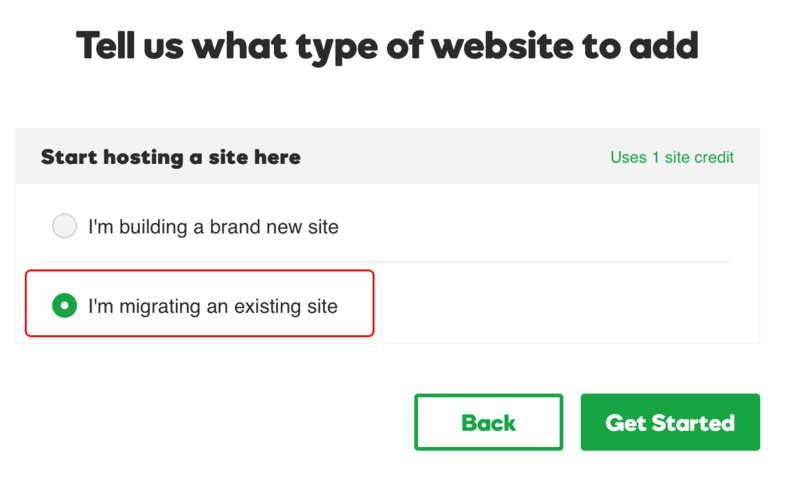 Note:If you have only one site available, we'll automatically select that plan for you and you won't see a list of your plans. Continue with the next step. Click I'm migrating an existing site, then click Get Started. Fill out the remaining fields to get your site migrated. We'll send an email when we're finished migrating your site. Note: You may need to update any permalinks in the site. Moving my PHP WordPress website to GoDaddy?